WELCOME! The Chinese Longitudinal Healthy Longevity Survey (CLHLS) has been supported by NIA/NIH grants R01 AG023627-01 (PI: Zeng Yi) (Grant name: Demographic Analysis of Healthy Longevity in China) and P01 AG 008761 (PI: Zeng Yi; Program Project Director: James W. Vaupel), awarded to Duke University, with Chinese matching support for personnel costs and some local expenses. UNFPA and the China Social Sciences Foundation provided additional support for expanding the 2002 CLHLS survey. The Max Planck Institute for Demographic Research has provided support for international training since the CLHLS 1998 baseline survey. Finally, in December 2004 the China Natural Sciences Foundation and the Hong Kong Research Grants Council (RGC) partnered with NIA/NIH, providing grants to partially support the CLHLS project. Until present, the CLHLS conducted face-to-face interviews with 8,959, 11,161, 20,428, 18,549 and 20,366, 10,188, and 7,192 individuals in 1998, 2000, 2002, 2005, 2008-09, 2011-12, and 2014, respectively, using internationally compatible questionnaires. Among the 96,843 interviews conducted in the seven waves, 16,547 were with centenarians, 22,232 with nonagenarians, 25,719 with octogenarians, 19,884 with younger elders aged 65-79, and 11,461 with middle-age adults aged 35-64. At each wave, survivors were re-interviewed, and deceased interviewees were replaced with new participants. Data on mortality and health status before dying for the 26,236 elders aged 65-110 who died between waves were collected in interviews with a close family member of the deceased. 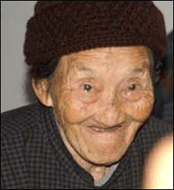 The CLHLS has the largest sample of centenarians in the world according to a report in Science (see the report). Our general goal is to shed new light on a better understanding of the determinants of healthy longevity of human beings. We are compiling extensive data on a much larger population of the oldest-old aged 80-112 than has previously been studied, with a comparison group of younger elders aged 65-79. We propose to use innovative demographic and statistical methods to analyze longitudinal survey data. Our goal is to determine which factors, out of a large set of social, behavioral, biological, and environmental risk factors, play an important role in healthy longevity. The large population size, the focus on healthy longevity (rather than on a specific disease or disorder), the simultaneous consideration of various risk factors, and the use of analytical strategies based on demographic concepts make this an innovative demographic data collection and research project. Collect intensive individual interview data including health, disability, demographic, family, socioeconomic, and behavioral risk factors for mortality and healthy longevity. Follow up the oldest-old and the comparison group of the younger elders, as well as some of the elders’ adult children to ascertain changes in their health status, care needs and costs, and associated factors. We will also ascertain mortality and causes of death, as well as care needs, costs, and health/disability status before death. Analyze the collected data to estimate the impacts of social, behavioral, environmental, and biological risk factors that are determinants of healthy longevity and mortality in the oldest-old. Compare the findings with results from other studies of large populations at advanced age. Sponsoring and Supporting Organizations National Institute on Aging; United Nations Fund for Population Activities (UNFPA) and China National Foundation for Social Sciences joined NIA to co-sponsor the expanded survey in 2002; China National Natural Science Foundation and Hong Kong Research Grant Council joined NIA to co-sponsored the expanded survey since Dec. 2004; Peking University and Duke University have provided institutional supports: Max Planck Institute for Demographic Research has provided support for international training since the CLHLS 1998 baseline survey.